Cabrillo Beach in San Pedro received an "F" on Heal the Bay's annual 2012 End of Summer Beach Report Card, but most coastal areas in California saw improving or excellent water quality. During the summer of 2012, Californians who headed to the beach were able to enjoy largely excellent water quality, according to an annual study released by Heal the Bay. The advocacy group's End of Summer Beach Report Card graded 96 percent of the state's beaches with a "A" or "B," marking a 4 percent uptick from last year. It was one of the cleanest summers for beach water quality ever recorded. The report (PDF) was released Tuesday. Beach grades are available at beachreportcard.org. The Bay Area's most popular beaches in Santa Cruz received a similar grade when compared to last year. 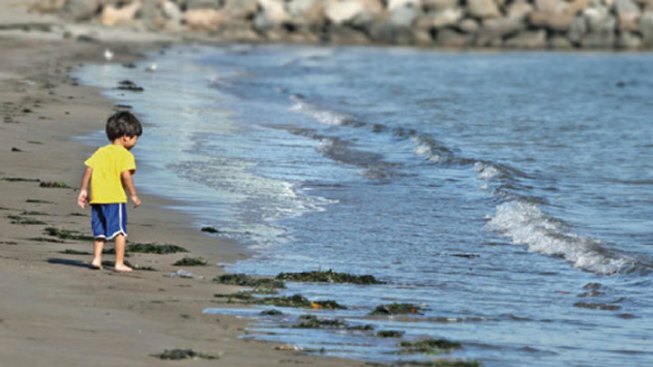 The report shows 77-percent of the beaches there got an "A" grade. It's worth noting Capitola Beach received a "C."
The beach quality just up the coast in San Mateo County improved with 82-percent of the beaches getting a A or a B grade. There were no known sewage spills in either county this summer. But all was not well along the Golden State's coast, Heal the Bay warned. That's because the nonprofit group was worried about two federal proposal that could have a "devastating effect on beach water quality programs throughout the entire country," according to the report. The Obama administration has proposed a budget for the U.S. Environmental Protection Agency that eliminates funding for grants that pay for beach monitoring, according to Heal the Bay. The proposed cuts would primarily affect county beach programs in Northern California. At the same time, Heal the Bay criticizes the EPA's new proposed limits on bacteria in recreational waters, saying they are "far less protective of the public health of swimmers than current science and good public policy dictate." Among other deficiencies that the advocacy group named, Heal the Bay argued that EPA did not include the latest science – including studies done at Santa Monica Bay and Doheny Beach – to develop the new criteria.